Today I'm sharing two books that my little one has been loving lately, and they bother pertain to counting. Of course we practise counting together without the use of books, but being the book lover that my son is, he greatly loves both the books I'm sharing below. Counting is one of Alexander's new favourite things - he can count to ten all by himself, as well as a few numbers after but that's as far as we've got. Alexander counts the stairs of a morning, he counts cars when he plays with them, he counts with the aid of puzzles and flash cards, he counts when building his duplo, sometimes he just counts for the sake of it. Counting is a thing right now! Although I hear numbers a million and one times a day, I love listening to Alexander count because he is actually a little behind in his speech so it's nice to be hearing words. 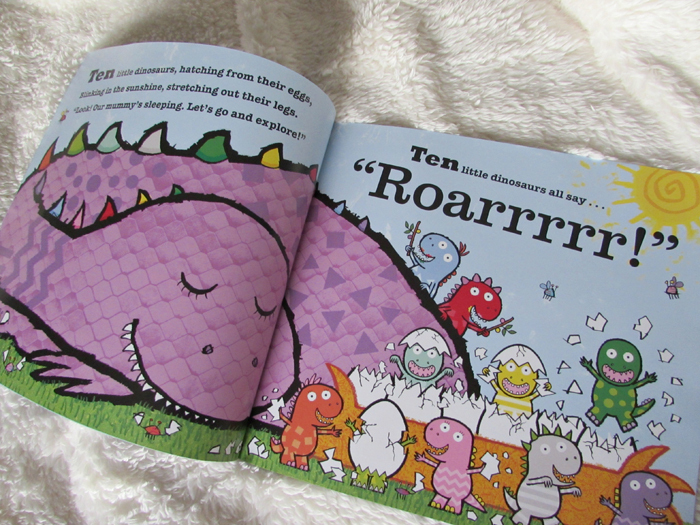 The first book I'm sharing features ten little dinosaurs that cheekily adventure off when their mummy goes to sleep. Finding themselves in mischief, the dinosaurs slowly dwindle down in number, ultimately all coming back together when the mummy dinosaur rounds them up. Within Ten Little Dinosaurs there is the opportunity to count backwards from ten to one as well as in the regular order of one and upwards. 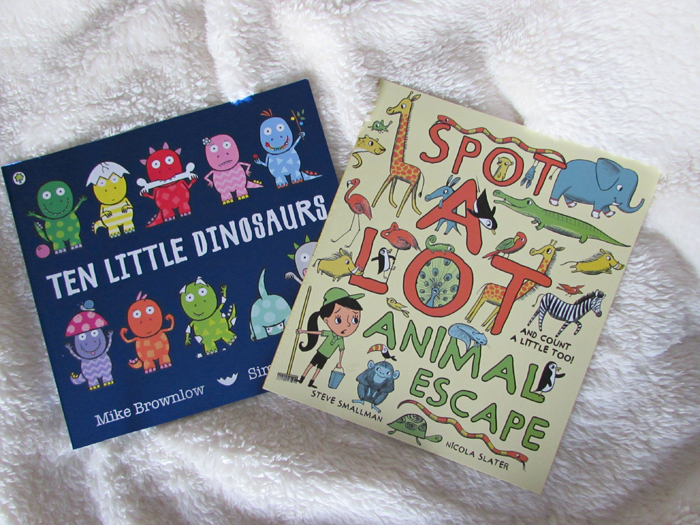 Tip | When looking for books to aid in teaching a toddler - in this instance, wanting to help with counting - going down the route of a pre-existing interest is a great idea. Alexander has a thing about dinosaurs and so I opted for a counting book involving dinosaurs. The other book that has helped us with counting is Spot A Lot Animal Escape. As the title suggests, a number of animals has escaped from the zoo and in the following pages the reader discovers animals within different scenes - 1 very tall giraffe trying not to laugh, 2 elephants in socks playing peek-a-book in the rocks etc. What I really like about this book in particular is the fact that whilst we count the animals page by page, there is also the aspect of spotting various animals throughout. This is the kind of book that'll stay in your collection for a while as there are varying challenges inside. 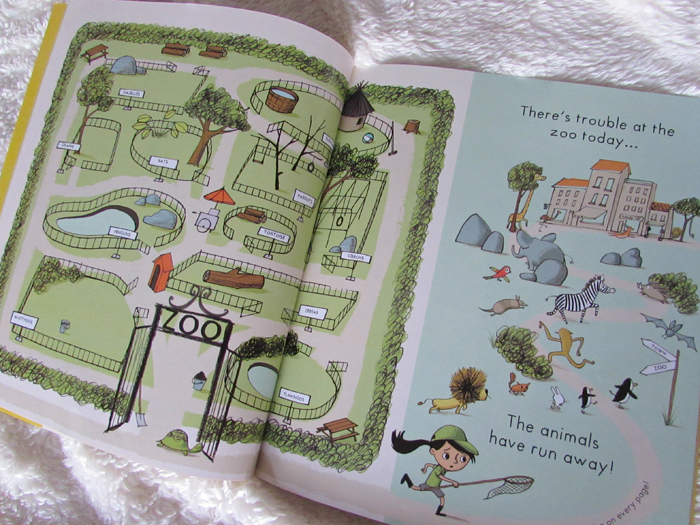 Aside from the content, I really like the illustrations in Spot A Lot Animal Escape, not only the style of art work but also the scenes on each page are full of fun and frolics with something new to be found each reading, by both adult and child! If you have any counting book recommendations then be sure to leave them in the comments below. That monsters book is so cute! My 4 year old would love it. Books of a monster variety (dinosaurs, creepy crawlies, dragons, monsters themselves) all go down well in this household!